Strengthen hair, prevent graying and stimulate hair growth with Alcepin Tuning and Caffeine Shampoo Duo. This duo contains two of Alpecin's best selling shampoos. - N.P. 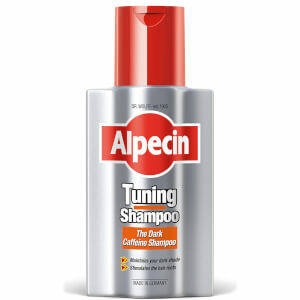 Reduce hair loss whilst fortifying the hair to its natural, dark color with the Alpecin Tuning shampoo. Containing an innovative caffeine complex which sinks into the roots after just 120 seconds, this caffeine shampoo helps to prevent the gray coloring of hair whilst enhancing volume and body. Perfect for everyday use.